Seasonal homes are abundant in Western North Carolina, and are particularly prominent among the more rural areas that provide access to the region’s cultural and natural resources and scenic views. These factors, coupled with an ideal mountain climate compared to the surrounding southeastern U.S., has gained national attention and has made the region a tourist destination (see Economic | Economic Sectors | Tourism). Typically designed to be isolated and private, seasonal homes are positioned to best enjoy the natural beauty of the region, but often lose their connectivity to the greater community and its infrastructure. According to the U.S. Census Bureau, a vacant home is categorized as either a rental property, a property listed for sale, a property for migrant workers, an abandoned property, or a property that is used for seasonal or recreational use. The accompanying graph shows the distribution of vacant housing types by county within the Mountain Resources Commission (MRC) region. With nearly 52 percent more vacant types for seasonal or recreational use compared to the state or national estimates, the economic impact of seasonal homes on the housing industry in the MRC region can be seen, as well as the importance of the tourism industry to the region. 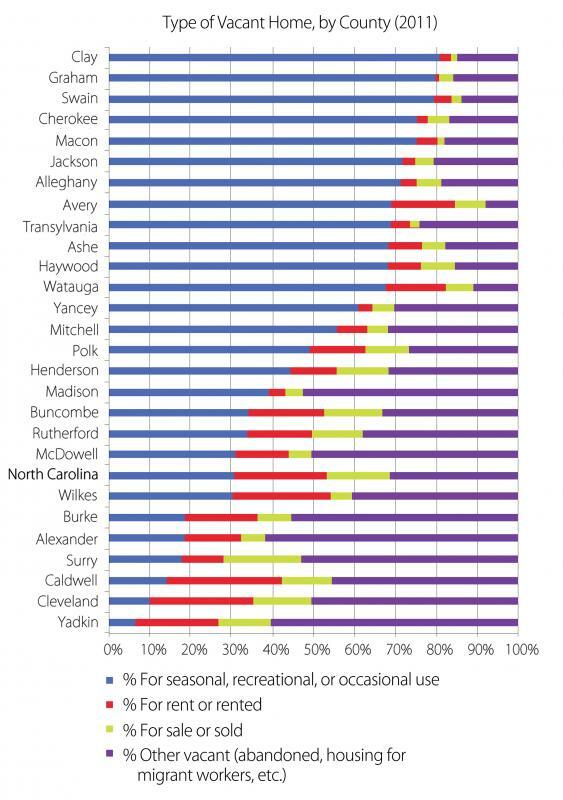 Sorted by county from highest percentage of seasonal vacant types to lowest, the graph shows that the southwestern-most counties in the region tend to have the highest number of seasonal vacant homes compared to the counties closest to the Piedmont region which, in many of those counties, have a lower percentage than the nation or state. When analyzing this data, it is important to consider the amount of vacant structures within each county, as well as the total number of housing units overall. For information on the number of housing units and percent of vacant structures per county, please see Housing Overview. U.S. Department of Commerce, United States Census Bureau. American FactFinder. 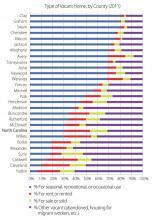 Accessed from: http://factfinder2.census.gov/faces/nav/jsf/pages/index.xhtml.